Posted on 21, August 2017 by EuropaWire PR Editors | This entry was posted in Awards, Education, Non Profit, Society, United Kingdom and tagged Lady Gretton, Loughborough Students’ Union Action, Loughborough University, Professor Robert Allison, Queen’s Award for Voluntary Service 2017, volunteer groups in the UK. Bookmark the permalink. LEICESTERSHIRE, 21-Aug-2017 — /EuropaWire/ — Loughborough Students’ Union (LSU) Action has received the Queen’s Award for Voluntary Service 2017, the highest possible award given to volunteer groups in the UK. This week, the award was presented at a ceremony held at Loughborough University where the Lord-Lieutenant, Jennifer, Lady Gretton presided on behalf of Her Majesty The Queen.The award was created by The Queen in 2002 to mark the occasion of her Golden Jubilee, recognising excellence in voluntary activities carried out by groups in the community. It is the MBE equivalent for volunteer groups. It was granted in recognition of LSU Action’s involvement in the local, national and international community – including soup kitchens for homeless people, dog walking at local kennels, providing relief for young children or carers facing disadvantage, and alleviating loneliness amongst the elderly. Loughborough student volunteers, known as Action Heroes, have volunteered over 100,000 hours in the community since 2014, when the application process for the award began, championed by previous Action Vice Presidents. This year, Action received the accolade under the supervision of Action Executive Officer Anna Milewska. Speaking at the presentation, she said: “Loughborough is beginning to be not only recognised for our academic or sport achievements, but also for the volunteering opportunities that help our students be involved in changing the world. 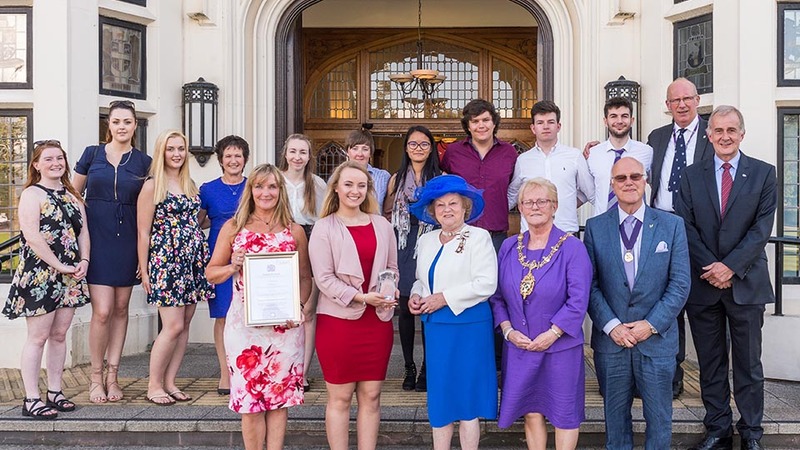 Presenting the award, Lady Gretton said: “To have achieved this Queen’s Award is a great tribute to Loughborough Students’ Union Action and its valued team of volunteer students as it is a very significant national honour. “I’m so pleased that today, one of the best examples of the county’s volunteering is being properly recognised and its’ worth acknowledged. Loughborough University’s Vice-Chancellor Professor Robert Allison said: “For me, this award epitomises Loughborough students. It’s not just what they do, but they also think carefully about how they do it, and they make a real difference. Of course, it is what I and all of my colleagues are really proud of.